Prime Minister Narendra Modi Sunday attacked the Congress, saying for the opposition party the defence sector was only about brokering deals. Modi's comments came after party president Rahul Gandhi recently upped the ante on the Rafale row by quoting a media report saying the PMO conducted "parallel" negotiations on the deal. "From the seas to the skies, the Congress has several scams associated with the defence and in the process the party did not allow the modernisation of defence forces for long years that they were in power," Modi said. Addressing a party rally at Perumanallur about 13 km from here, he said the NDA's work culture was different from that of the previous governments. Targeting the Congress, he said "those who had got opportunity to rule the nation for years did not bother about India's defence sector. For them this sector was only about brokering deals and helping their own set of friends." "The NDA's approach to national security is different," he said and outlined that it was the dream of his government that India be self-sufficient in defence production and where "our forces have all possible support they require in keeping our nation safe." He referred to the "pathbreaking" step of creating two defence corridors one of which is in Tamil Nadu. 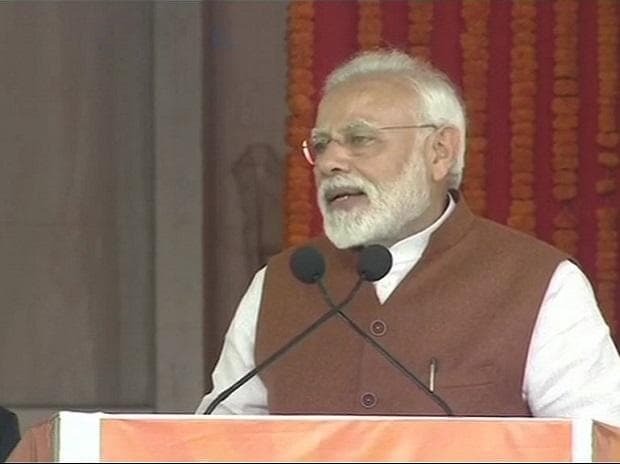 On the opposition attack on him, the Prime Minister said their "political culture of abusing Modi may give them some space in television but the elections are fought on ones vision for the nation, not slander and attack." The good work of the NDA government has made some people very unhappy and their unhappiness has turned into desperation and abuse for Modi, he said. Remembering Congress stalwart and former chief minister of Tamil Nadu, the late K Kamaraj, he said the "great" leader always wanted a government in power which has zero tolerance towards corruption. "You have placed a government in Delhi who is putting a lock on corruption," Modi said. He recalled the NDA government had brought a legislation for providing 10 per cent reservation for the poor in the general category and this was done without altering the existing reservation system in the country. On the PM Kisan Yojana scheme, he said it was a yearly benefit and will ensure Rs.7.5 lakh crore goes to the bank accounts of the farmers in 10 years. For the first time in India's history, a government has spoken about doubling of farmer's income rather than giving them loan waivers as promised by Opposition as a part of their "election propaganda." "Our goal is to improve ease of living for all Indians," he said referring to foundation stone laying for several projects including those related to ESIC hospitals. Modi began his speech in Tamil by saying "Vanakkam," and added that he bowed to the "land of Tirupur," which is known for its bravery. Modi referred to freedom fighters including Tirupur Kumaran for their sacrifices. He said Namo merchandise like T-shirts were made in Tirupur and praised the region's enterprising spirit. He also lauded a Jain guru for his peace initiatives. Speaking on the occasion, Tamil Nadu unit BJP president Tamilisai Soundararajan hit out at the main opposition DMK and lauded the Prime Minister for his welfare initiatives. Even as Modi arrived at the venue of the meeting, slogans like "Vendum Modi," (we want Modi), rent the air. Modi's Sunday rally here was the second such BJP event in less than a month in Tamil Nadu. On January 27, he addressed a grand party rally at Madurai after laying a foundation stone for the AIIMS hospital there. Modi had in the recent past held a slew of video conferences based interactions with party workers of Tamil Nadu.